3 Why Do We Need Leaders? Defining leadership might seem very simple, but if you asked 100 leadership experts to define it, you’d probably get 100 different answers. LEADERSHIP IS ABOUT ARTICULATING VISIONS, EMBODYING VALUES, AND CREATING THE ENVIRONMENT WITHIN WHICH THINGS CAN BE ACCOMPLISHED. Leaders come in all shapes and sizes, from those who have founded and run successful companies, to political leaders, through to community leaders. If you’re in any way unclear on what leadership is then we recommend starting with our article What is Leadership? Our book provides a step-by-step guide to manage any project for both new and experienced project managers. The templates associated with the book give you the practical tools you need to get your project up and running fast. If you were asked this question what answer would you give? Many people think that we need leaders manage large groups of people, for example, a country needs a head of state, an organization needs a CEO. etc. But there is more to it than this. The need for leadership is much more natural and human than that. Leadership is something that we as humans grow up as part of the human experience. In adult life, we seek out leaders too. People who will guide us in making sense of the world. To explore why we need leaders in more detail, read the article Why Do We Need Leaders? If you’d like to learn more about the delivery aspect of leadership we have many articles about this in our Change Management section. Most good leaders will be able to adjust their style of leadership depending on the situation they find themselves in. This is known as situational leadership. 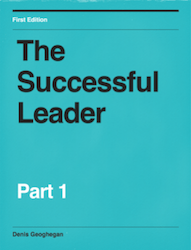 You can learn more about leadership styles in our Leadership Styles article.